This exceptional decaffeinated blend has a fragrance that is absolutely unmistakable. 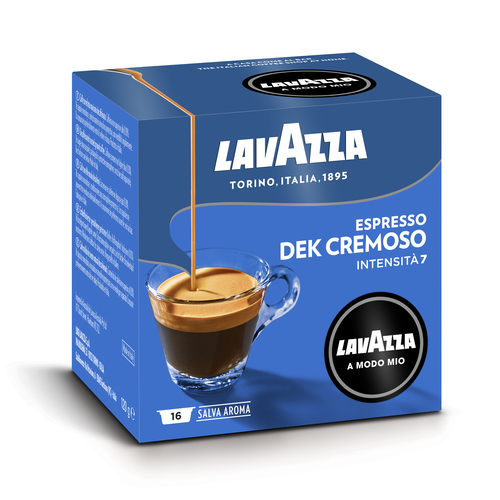 A smooth and well balanced coffee that's perfectly formed in every way, with a velvety crema. The authentic Italian espresso, naturally decaffeinated. An exceptional blend of sweet and full-bodied Brazilian Arabica, decaffeinated using a purely natural method to keep its fragrance intact, and then roasted to bring out its full and well balanced taste, while preserving its body. The authentic Italian espresso, naturally decaffeinated. Biscotti di Meliga from Piedmont are buttery corn pastries with a subtle lemony aftertaste. Meliga pastries are ideal to accompany the sweet and balanced bouquet of Cremosamente Dek.